Head on view of the S.55X shows ample space between the hulls in which the aircraft could use for external storage of bombs and/or torpedoes. Fuel was carried in multiple tanks in both hulls. The circular radiator served to cool both engines. When planning to cross the Atlantic Ocean in the 20s and 30s pilots settled on just one aircraft for the attempt. 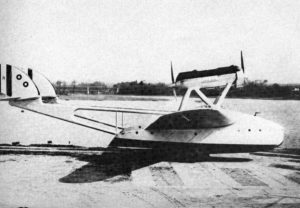 So when Italy’s Minister of Air, General Italo Balbo, in 1933 announced his plan to lead a squadron of 25 seaplanes across the Atlantic it was looked upon as fool-hardy, dangerous and an impossible stunt sure to fail. However, the flight if successful, would also convincingly prove to the world that the Italian Air Force was one to be respected and reckoned with. General Italo Balbo had early-on developed a career planning and commanding a number of large formation flights over long distances around the Mediterranean sea. Between December 17, 1930 and January 15, 1931 he led 12 Savio-Marchetti S.55 flying boats from Rome, across the South Atlantic Ocean to Rio de Janeiro, Brazil. His crowning achievement, however, took place in 1933 when he led an armada of 24 Savoia-Marchetti S.55X seaplanes across the North Atlantic. It proved to be one of that eras most spectacular aerial achievements which in turn elevated Balbo to a world-wide celebrity and hero status. The twin engine, twin hull S.55X seaplane was designed by Alessandro Marchetti to produce the most efficient aircraft for long range trans-oceanic flights–one faster, stronger, more powerful, and more dependable than any aircraft available at that time. With its two 18 cylinder Isotta Fraschini water cooled 880 hp engines mounted in tandem on pylons atop the 71 ft. 11 in. cantilever wing the seaplane had a cruising speed of 145 mph and a maximum cruising range of 2,800 miles. The flight originated July 1 at Orbetello, Italy with a squadron of 25 aircraft. Final destination was the “Century of Progress” World’s Fair in Chicago, Illinois. The airplanes arrived at Chicago July 16, completing a 6,100 mile flight when their armada touched down on the waters of Lake Michigan adjacent to the fair grounds. Unfortunately they had lost an aircraft in a crash at Amsterdam early in the flight resulting in one flier killed and four crew members injured. This was the only serious incident involving the remaining 24 seaplanes as they continued their mass flight over land and ocean. Chicago and the American public gave General Italo Balbo and his 96 crew members a tumultuous welcome. Along with many other awards Chicago also held a big parade and named a street after the general. On July 19 the 24 seaplanes started their return journey back to Italy, which included a next day stop in Washington, DC where Balbo and his officers had lunch at the White House. Next stop was New York which gave the flyers a ticker-tape parade matching that given to Charles Lindbergh in 1927. Unfortunately the armada lost another aircraft and a crew member was fatally injured when attempting to takeoff in the Azores August 9. The remaining armada arrived in Italy August 12 to be greeted by huge cheering crowds with celebrations in Rome and other cities throughout Italy. General Italo Balbo, was at this time, one of the most popular men in Italy and that apparently did not sit well with Fascist dictator Il Duce Benito Mussolini. Evidently Mussolini considered Balbo’s popularity a threat and in early November 1933, just a few months following his triumphant trans-Atlantic flight to Chicago, Balbo resigned his position as Air Marshal. He was appointed, (to apparent exile), with the title of Governor-General of the Italian colony of Libya. On June 28, 1940, early in World War II he was killed, when the aircraft he was on was shot down by friendly fire while attempting to land at a Libyan airfield in Tobruk. It was reported that gunners on the ground mis-identified the aircraft, mistaking it to be an enemy craft. He was 44 years old. The following article, The Italian Armada, by Don Berliner is reprinted from the Summer 1973 edition of NATIONAL AERONAUTICS. Forty years ago, on July 1, 1933, 25 Savoia-Marchetti S. M. 55X flying boats took off from Orbettello, Italy, on a historic mission. Sectional diagram showing the general arrangement of the long distance Italian Savoia-Marchetti seaplanes. The Europe-bound traveler is faced with a maze of confusing arguments over special airline fares. Often, he doesn’t know very far in advance just how much his trip will eventually cost. A nuisance, true, but what better proof could there be that long-distance air travel has come a very long way? The concern is not with safety, for that is well established; it is not with speed. for who frets over a seven-hour journey between the New World and the Old; and it is not with comfort, for jumbo­jet trips are so easy that boredom is a bigger problem. But ’twas not always the case. The first aerial crossing of the North Atlantic which was outside the exploratory class of Alcock and Brown, or Lindbergh, took almost two weeks, half of which was spent sitting out horrible weather. Yet 24 of the original 25 airplanes completed the 6,000-mile flight with the loss of but one crew member. By the standards of 1933, this was a signal achievement. The key to this success was the element which would lead to regularly scheduled passenger flights between America and Europe in 1939, and to routine vacation travel between the continents by the 1960s: meticulous planning. The first flights across that vast, cold ocean had been pure adventure, much like the pioneering voyages of Columbus. If such journeys were ever to amount to more than great adventures, a large measure of dependability would have to be injected. One of the first to see the importance of long-range flying was a flamboyant fascist, General Italo Balbo, Air Minister of Mussolini’s Italy. A series of increasingly ambitious flights with large groups of flying boats brought Balbo to world attention in the days when the aggressive nature of Fascist Italy was still to be demonstrated to a naive world. It all began in 1928; when Balbo, then relatively unknown, led a formation of 61 hydroplanes across the western Mediterranean. He followed this up with a mass flight of 36 army bombers across the eastern Mediterranean and the Black Sea. With this experience behind him, and encouraged by an adoring public, Balbo took aim on a much bigger challenge: The Atlantic. A full year of planning and preparation led to a successful trip from Rome across the South Atlantic to Brazil .in 1931, at the head of a formation of 12 Savoia-Marchetti S-55 flying boats. A mass flight around the world seemed to be the next logical step, but before this could go into serious planning, a trip across the North Atlantic took its place. For more than two years the. preparations went on: routes. weather, airplanes. fuel, spare parts, engines, pilots, crews, ground support. Just to make the trip would not be enough. It had to be done in style and with a high degree of efficiency. For, as Balbo would announce at every possible opportunity along the way, it would be done for God, for the King and for Il Duce. Long after the King had been deposed and Il Duce exposed and killed, the impact of the flight remained on aviation and on the world. One of the most memorable aspects of the entire operation was the airplane chosen: A strange-looking flying boat, with fragile twin tail booms extending from massive twin hulls, and a nacelle holding two tandem engines perched atop the wing. It was a more powerful, more streamlined, more rugged version of the craft which carried Balbo and company to Brazil. To the tens of thousands who saw them, the S-55-X would remain a most unique sight. One of the Isotta Fraschini 880 h.p. engines and the twin-engine installation on the S.55X. But the 72-foot wingspan airplanes with their 1,600 horsepower weren’t chosen for appearance, but rather for range, load-carrying ability and dependability. A long series of tests had proven to the satisfaction of Italo Balbo that the S-55-X could take long hours of hard flying, and still come through. Today, Atlantic flying is done far above most of the weather that batters that part of the world. Forty years ago, you had to be ready to fight your way through it. Scale outline drawings of the Italian Savoia-Marchetti S.55X seaplane. Take off was from Orbetello, not far from Rome, at sunrise on Saturday, July 1, 1933. Balbo himself led the way in “1-BALB”, clearing the water at 5:37 a.m. local time. One by one the others followed, forming into platoons of the airplanes and flying as close together as the visibility permitted. They swept proudly over Genoa and headed for their first challenge: The Alps. The skies were crystal clear, but the Alps are high, and the heavily loaded flying boats strained to clear the snowy peaks. Up to 13,000 feet they went, without oxygen or enough cabin heat. Once clear, they were able to descend over Zurich, Switzerland, and then down to 800 feet in an effort to reduce the effects of rough turbulence near Strasbourg, on the French-German border. The angular setting of engines, wing, and tail relative to hulls is interesting in this shot of one of Balbo’s fleet afloat. Two stars on fin identify particular craft, markings being changed ship to ship. Formations consisted of three-plane “platoons”. On past Dusseldorf they cruised at 140 mph, acknowledging a stream of encouraging messages from radio stations along the way. Finally, after 6 hours and 20 minutes, they completed the 870-mile first leg to Amsterdam. Twenty-four boats landed on the water without incident, but one hit a dike on final approach and flipped over. Three crew members including the pilot were injured, and a mechanic was killed. So early in the flight, and not yet over the Atlantic. Enthusiasm for a great celebration dissolved. But such accidents had been considered, and there was no thought of turning back. At 6:10 the next morning, the first of 24 airplanes lifted off and headed for Ireland. Crossing the North Sea, they ran into its traditionally bad weather and were forced to fly a mere 150 feet above the water, for visibility was down to barely 100 yards. They sighted the coast of England after two hours of battling rain and fog. Up along the east coast, across Scotland and finally to Londonderry, Ireland, 630 miles in almost 6½ hours. Winds had cut their average speed down to 102 mph. For two days they sat in Ireland, waiting for favorable reports on the weather conditions between there and Iceland. On July 5, they got the go-ahead for the 930-mile hop to that barren land, and took off. For the first few hours, it was clear and calm, but then the sea fog settled in and forced the flotilla down to 300 feet above the cold, rough ocean. Visibility gradually improved to a half mile, but then the heavy rains came, followed by more fog. The fog lifted, but the rain turned to snow. By the time Iceland’s off-shore islands came into view, even their rocky, tree-less land­scapes were a welcome sight. The receptions and other social functions in Iceland’s capital of Reykjavik lasted for days, because the weather reports covering the 1,500 miles to Labrador promised continuous trouble. That leg of the trip was the longest, and thus the most hazardous, and so the need was greater than ever for a firm forecast of reasonable weather. In flight, the unconventional boats appeared to be almost all wing. Since 1928, General Italo Ballbo, Italy’s Air Minister in the Mussolini days, was interested in mass flights. In that year he led a flight of 61 hydroplanes across the Western Mediterranean. After five days of waiting, a few of the big boats attempted to take off on July 12, but failed. Finally, on July 13, they all made it and headed west, low and careful at 450-foot altitude, groping their way through fog for a full hour. A slight lessening of the fog allowed the wide-spread formation to climb gradually to 800 feet by the time they passed Cape Farewell. Back down to 150 feet because of worsening fog, they finally crossed the shore of Labrador and North America, and landed at Cartwright after 12 hours in the air. From there, the majestic formation headed triumphantly along the Gulf of St. Lawrence to Shediac on the coast of New Brunswick. After an overnight stop there, they proceeded across Maine to Montreal, where tragedy was narrowly averted when several of the flying boats almost hit pleasure craft in the harbor. After another short stay filled with cheers and toasts, they circled the city and set sail for Chicago, the ultimate destination. But the route was so full of bad weather that a major detour of 150 miles was forced upon Balbo and his men. They flew west to Georgian Bay, then south to Detroit, Toledo, Ft. Wayne and then back north to Chicago. Because of the last-minute change in route, much of this 870-mile leg was flown without proper maps. But they made it to Chicago and were greeted as few had ever been greeted before: tooting boat whistles, cheering masses of humanity, welcoming formations of American airplanes, and all manner of Italian dignitaries. Messages of congratulations were received from the world’s leaders, but especially from Mussolini and the Pope. Balbo was elated, for he had achieved his announced goal with all but one of his men and one of his airplanes. “It is a fine adventure that appeals to the airman’s sporting nature,” he later wrote. “But consciously or unconsciously, he is actuated also by a loftier motive – that of bridging most effectively the gap between the old and the new worlds. A man’s subconsciousness frequently echoes the unexpressed hopes of the masses of his fellow men. For its day, the S.55X was an exciting concept. In effect twin “pontoons” were two hulls. The thick cantilever wing afforded space for crew members. Thus did Italo Balbo see his 6,100-mile mass flight from Rome to Chicago, and the return trip via the Azores, which took even longer and cost an additional crewman and another airplane. And while praise was heaped upon Balbo and his men for a great achievement, the long-range implications of mass flights across oceans were not lost upon those who were soon to become involved in a total world war. Long-distance bombing missions from one continent to the other were still in the future, but the routes had been pioneered. As it turned out, Balbo’s flight was never to be duplicated by bombers on their way to targets in unfriendly countries. But both his northern and southern Atlantic routes became heavily traveled airways, as American-built war­ planes streamed across to supply the means for ending a war in which Balbo’s homeland had played a major role in starting. The colorful, personable Italian flyer was never to see this, or the subsequent parade of airliners which have linked the continents as he had dreamed. Politics and jealousy interfered: Mussolini, envious of the fame of his subordinate, exiled Balbo to the post of governor of the Italian colony of Libya. Not long after Italy went to war with England and France in June of 1940, Balbo was shot down over Tobruk, along the Mediterranean, near Egypt. More than one historian blames Mussolini, though nothing was ever proven. But there is little doubt that Italo Balbo’s greatest triumph led directly to his end, and indirectly to the end of the government whose flag he proudly carried from Rome to Chicago.